This will be a relatively short blog, but sometimes it's the little things in life that are often the most memorable. A couple of weeks ago I stumbled onto an incredibly simple mushroom recipe that has had me CRAVING mushrooms ever since. I served the mushrooms on top of a filet mignon, along w/ a side of baked potato, and asparagus w/ roasted mushrooms and pronounced dinner done. 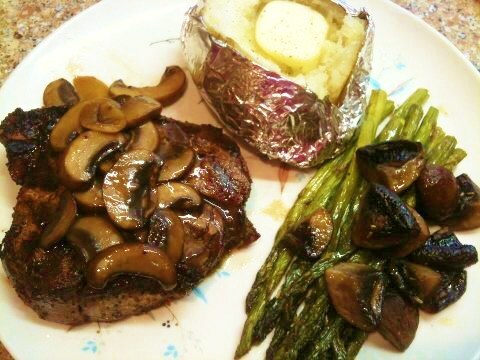 I didn't think too much about it, but I submitted a picture of my dinner (mainly the mushrooms) to Allrecipes.com b/c the mushrooms didn't have a picture and were therefore a "faceless" recipe.